This is what you’ll discover in It’s a Match! 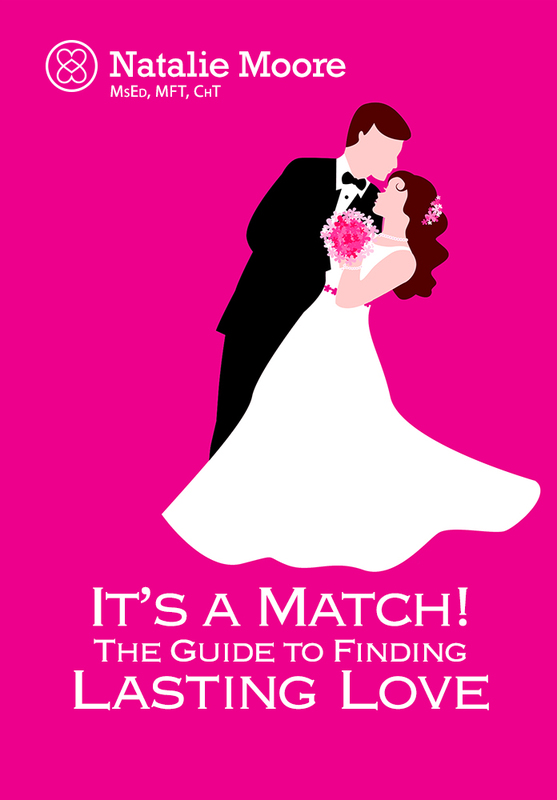 The Guide to Finding Lasting Love, the new book by the experienced and successful Relationship Coach and Marriage and Family Therapist, Natalie Moore. She combines her professional expertise with her own personal experience in finding, getting, and keeping a higher-level match. Natalie’s book will help you find what you want. With kindness, humor, and psychoanalytic insight she gives you the inspirational tools to improve, enrich, and empower yourself. Get the keys to having a lasting relationship, to becoming the best version of yourself, and to being happier with yourself than you’ve ever been. You’ll also get practical advice. Natalie will show you how to dramatically improve your odds of finding “the one for you” using the power of the Internet and digital dating sites. She’ll help you navigate the world of online dating. She’ll help you find your perfect match. Everything starts with this important idea: To find Mr. or Ms. Right, you have to stop attracting Mr. or Ms. Wrong. You have to know what you want, and understand why you keep attracting people who can’t give this to you. Then you have to make course corrections to your previous patterns. Sustain your new higher vibration so you can attract the partner you want and get the relationship you deserve. The sad fact is that almost half of all marriages end in divorce. Natalie has identified the reasons why, and she explains what makes a relationship great. Her approach can help you find, develop, and experience real and lasting love. You will learn Natalie Moore’s “4 Levels of Love” – the groundbreaking, game-changing system for defining, quantifying, and achieving true love. This system will help you recognize the level of relationship you have when you start dating your potential mate or if you’re already in a romantic bond. Do you have a doomed Level I relationship or a marginal Level II relationship? These account for the 50% divorce rate in most industrial nations. Or do you have a successful Level III or Level IV relationship? Once you know how to define the characteristics of a great relationship, you can learn how to beat the odds, find true love, and have a successful, enduring high-level match. Online dating services give us millions of choices, literally. But having more choices just increases the odds of finding Someone. Finding “The Right One” takes skill and knowledge. Natalie helps you sort through the various services: eHarmony, Match.com, JDate, and an ever- expanding list of others to help you figure out which option is best for you. You will also learn winning strategies to help you stand out from the crowd, and guidance on selecting the photos and words that will show the best version of the real you. Further, you will learn how to “read between the lines” of other people’s profiles and really “see” what their pictures reveal. It is a Match! The Guide to Finding Lasting Love is written for the woman or man who is tired of looking for Mr. or Ms. Right… and finding only Mr. or Ms. I Should Have Known Better, Mr. or Ms. I Should Have Seen That Coming, or their not- so-distant cousin, Mr. or Ms. What Was I Thinking? Natalie Moore’s extraordinary five-step process is designed to help you find and keep your perfect match – your Level III or Level IV match, the Divine Partnership . But you have to be willing to do the work…. to learn and practice the lessons in Natalie’s book. Each chapter is filled with lessons and exercises to guide your process. Start today!